Last edited by Hyver; August 24th, 2006 at 11:01 PM. Hyver!...Good Job! Thanks....Hope Mr. Rook is ok. Damn Dominus, that WAS fast! I gotta do this one, first of all the topic is awesome, and second I have no excuses for not getting a decent enviro done, seeing as how it is currently my main area of study. Ruined Shipyard huh? I call spaceships! I think Hideyoshi called spaceships when he went: "AHHHHHHH! o____O!" haha, yeah you are probably right. well then I guess it will be a real challenge to outdo him, and I do love a good challenge! I'd really like to enter, just depends on whether I find time. Trying to work on something for the new topic but it is still very confused... I have other ideas, I will try to paint something else during the week. Any suggestions ou critics are mostly welcomed. Do not hesitate to save my picture and draw on it in order to tell me what is wrong. 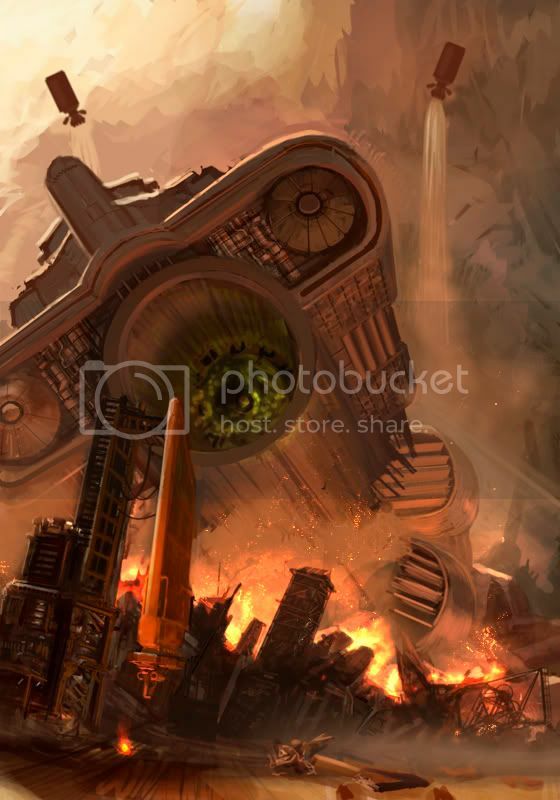 My first idea was that a big starship crashed on the shipyard. ferak seg: Nice style! 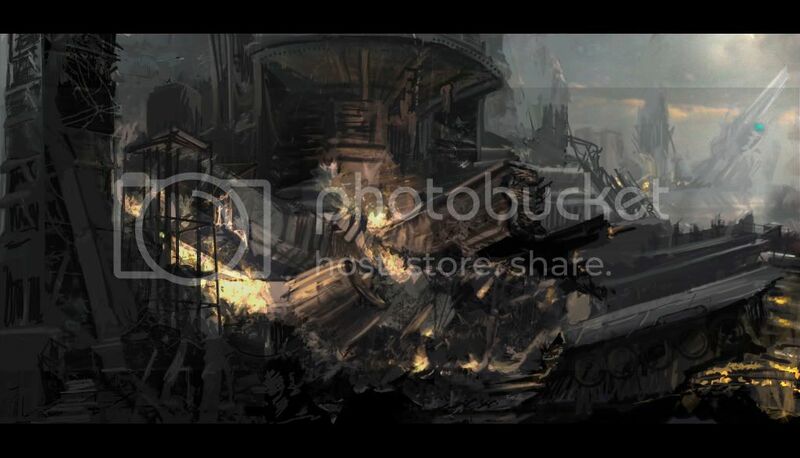 That is one destroyed shipyard! Good sketch! Thank you very much dragon4lunch! Hope to see one of yours! It's been a long time since you haven't participate at EOW, have you? It still have a problem about making foreground, middleground much more distinctive. 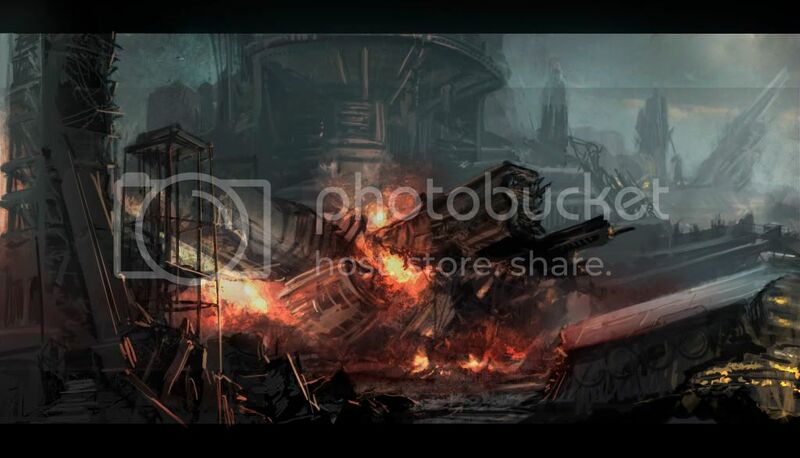 Maybe I shall increase the contrast by making the foreground darker and add some smoke in the middle ground to detach the crashed starship and of course make it burning much more... the fire looks cold for the moment. I think your self-critique is right on the money, so all I did was what you suggested: try to get some separation between the layers of background and warm up the fire (though this might be more color than you want - I don't know). You can't go any blacker than black, so rather than darkening the foreground layer I think you'll have to keep lightening things progressively farther back. I hope you find this helpful (or at least amusing) but you pretty much already know what to do. Feel free to paint all over my snail thing in the creature of the week thread - after it goes up in a few hours. I can't believe you guys got these paintings up before I even noticed the new thread. new image down the page! Last edited by Hideyoshi; August 30th, 2006 at 11:36 AM. You can't be serious, Hideyoshi, that looks great. Very atmospheric. The ferak + Chuck paintover is also looking good. Chuck Wadey - looks great but does not resable a shipyard..imho. nice inspiration pics, thx also, Erilaz! We don't know yet if it was because of some sort engine failure or an act of sabotage but the cargo crashed suddenly during the landing procedure. When it started to fall, nothing could prevent the destruction of all our facilities. For the moment let's concentrate in putting out the fire and finding the survivors! Last edited by ferak seg; September 3rd, 2006 at 03:06 PM. I'm far not as good as you guys are, but this is a shame. So less participaters for environments. Thats not good. I will participate next week I think, at the moment i'm stuck in another project, so no time left. There have to be more to make good entrys for this activity. Colonna's Founder, designed and built his shipyard just ten years after the War Between the States.Charles is working together with ShipyardXchange to establish integrated channels, with access to all of the 14 Kvaerner shipyards throughout the galaxy, to provide exchange and collaborative capabilities for all the suppliers in their network. awesome stuff so far people! don't forget to add a description before deadline! Last edited by Hideyoshi; August 31st, 2006 at 03:32 PM. I think i will have a go at this one! it will be my first EOW ever! Ferak Seg: Both pieces are incredibly cool, but I agree that the second one has more going for it; it has more character. 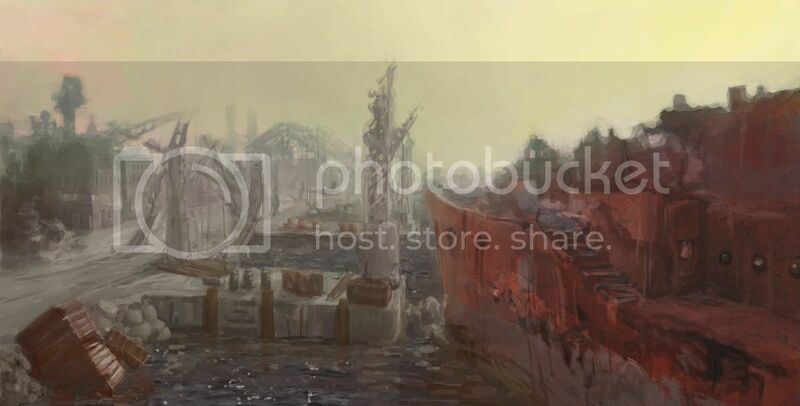 Description: As the climate grew more radical and cities more self-sufficient (due in part to technology), the crude shipyards of the Great Bay fell as quickly as they arose--a growing trend of mankind's achievements. Last edited by Johnnyhorse; September 2nd, 2006 at 09:53 PM. johnny-i am not anyone to be helping anyone else out, but i think distinguishing the 'port' from the ground would help it a little- maybe some more contrasting colors, or a more definite line between them? 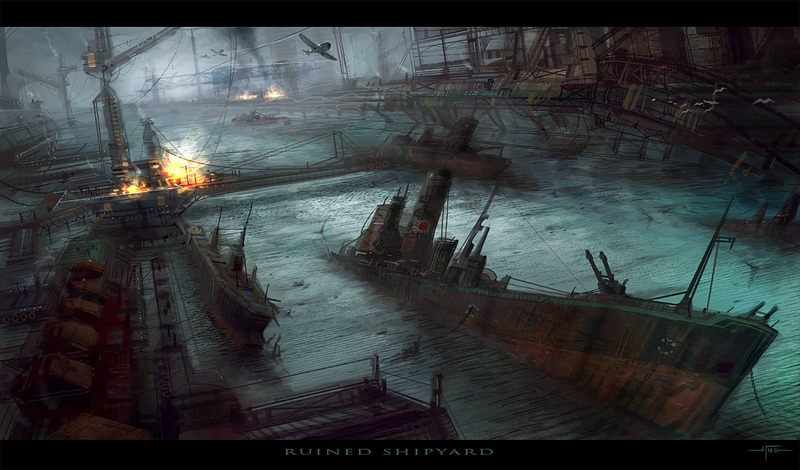 damn hideyoshi... that's one hell of a ruined shipyard.. damn ove the tilted ship in the foreground, nice work!